Premium Cast Vinyl is a smooth, glossy vinyl formed from a poured solution into a cast shape. After drying the Vinyl is rolled and cut to a particular size to be used in production of your graphics or letters. 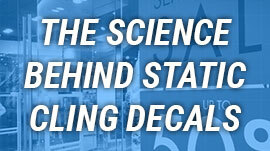 For this reason, Premium Cast Vinyl will not shrink over time and is considered superior to Standard Calendered Vinyl. We strongly encourage this option if you intend to have your vinyl outdoors for any extended period of time. In addition to this, Premium Vinyl is UV protected to help fight against the sun’s harshest elements and may last upwards of ten years with proper care and maintenance. Once your surface is prepped it is time to start marking your surface so you can apply your lettering. There are multiple ways of measuring, for advanced users you could judge the graphic against the surface using your eyes and best judgement. However, for most users we do encourage the use of a wax pen and tape measure. The first step is to understand the height and width of your decal/lettering. Next you will measure your surface and find the center of your intended application. Using your tape measure, measure out from the center of your intended position and mark the center and outer bounds of your graphic using the wax pencil. 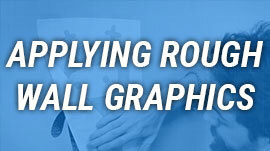 Using your space as reference, find the orientation you plan on leveling your graphic to. Keep in mind your boat may not sit level in the water, so leveling your graphic to the ground may not be ideal. Next mark your lettering, by marking the top of the application tape with your wax pencil. Do not press down too hard, as you do not want to damage your graphic. Now you'll align the mark on your surface with the mark on your graphic. 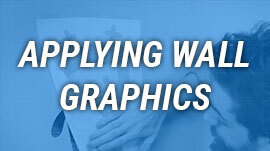 The first step to applying your lettering or graphics is to cover your work area with a mist of application fluid. You cannot put too much application fluid on your work area- however, it will increase the amount of dry time later in the application. As per our previous tutorials, you should have marked your vinyl and surface area with a wax pen. For this reason, we will carry on with the installation. Next you will want to remove the vinyl from the masking tape, by pulling on the vinyl paper more than the tape itself. Pull the paper halfway through your design, leaving the other half concealed by the masking tape. 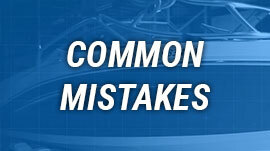 You may choose to optionally tear off the part you’ve removed if the tape is getting in your way. Next you will center your design with the wax mark, with the mark you’ve left on your surface. This will ensure the design is centered. Once you’ve aligned your design and applied the first half onto the surface, feel free to pull away the last half of the design paper from the masking tape and gently smooth the remainder onto your surface. Because you’ve wet the surface down with Application Fluid, you will have some forgiveness if you need to pull the design back up and readjust its position. Using a hard squeegee you will want to smooth out the design by pressing gently from the center out. The goal is to remove as much application fluid or bubbles from the design before it sets on your surface. Because you have used application fluid you should wait some amount of time (as little as 5 minutes) before checking to see if your lettering is beginning to stick. Do not remove the tape if the vinyl is not sticking to your surface. How you remove the Vinyl is very important. Do not pull the masking tape away from your surface, but instead pull along the surface of your surface to reduce stress on your newly applied vinyl. First, start by pulling on a corner of your masking tape and apply a slow steady pressure Once the masking tape has been removed, feel free to use alcohol to remove the wax pencil marks on your surface. If you notice any further bubbles under your vinyl, use a Soft Squeegee to gently smooth the vinyl out. Do not use the hard squeegee, as this may damage your design. First you should consider the surface your decal or lettering is being applied. Best surfaces will be clean, shiny and smooth. Next you should wipe down your work area with rubbing alcohol which will evaporate quickly and leave no chemical staining behind that may interfere with your vinyl. This process will also remove any dust or dirt that may become lodged permanently under your decal if not cleaned properly. 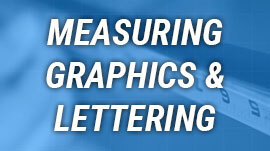 Understanding where your lettering or graphics will be placed is ultimately up to you. But you should consider the placement based on visual cues. Are there contour lines running down your surface? Is there a general shape or direction that your surface seems to progress? What will maximize visibility? Is this placement going to become dirty easily from wheels or exhaust? The last critical step to preparing your surface is to mark out your decal or lettering. You should be prepared with the knowledge of how wide and tall your decal is. 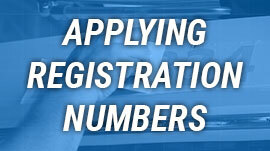 This will ensure your design is level and centered correctly upon applying. First, find multiple positions on your graphic or lettering you can use as a level guideline horizontally across your design. This could be the bottom of letters or a graphic. So long as it provides a horizontal line you can align with the marks you’ll be placing on your surface. Do not use the borders of the paper backing as your leveling line. You will use this horizontal line a guide for leveling your design. Keep in mind, not all designs require to be leveled. In some cases such as a boat that will float in water, the design may need to be purposefully slanted. Now we will determine the center of your decal, to do this measure the width of your design using a tape measure. Cutting this number in half and placing a mark on your decal using a wax pen will ensure this is the center. In the next lesson we can discover how to mark your boat to match these measurements. Once your surface is prepped it is time to start marking your surface so you can apply your lettering. There are multiple ways of measuring, for advanced users you could judge the graphic against the surface using your eyes and best judgement. However, for most users we do encourage the use of a wax pen and tape measure. The first step is to understand the height and width of your decal/lettering. Next you will measure your surface and find the center of your intended application. Using your tape measure, measure out from the center of your intended position and mark the center and outer bounds of your graphic using the wax pencil. Using your space as reference, find the orientation you plan on leveling your graphic to. 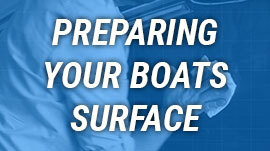 Keep in mind your boat may not sit level in the water, so leveling your graphic to the ground may not be ideal. Next mark your lettering, by marking the top of the application tape with your wax pencil. Do not press down too hard, as you do not want to damage your graphic. Now you will align the mark on your surface with the mark on your graphic. Standard Vinyl. What is it?... And is it better than Premium?... 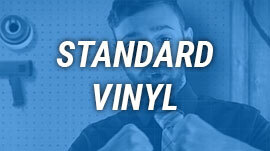 Let’s rewind and first understand what Standard Calendered Vinyl is. 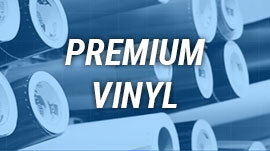 Calendered Vinyl, refers to the process it’s manufactured from. To put it simply, when calendered vinyl is formed, first the Vinyl is clumped together into a large ball. This ball is then stretched into a long sheet, which is then rolled onto a tube for our use... This distinction is very important however, as Calendered Vinyl may shrink over extended periods of time, especially when placed in direct sunlight or heat. This is because the Vinyl is attempting to return to a much smaller shape. [Vinyl may shrink up to 2-3% over it’s lifetime] This may seem like a disadvantage, but depending on the location and application you intend applying Calendared Vinyl to- this may not be the case... Consider this, Standard Calendered Vinyl is the most economic vinyl available, it also has a lifespan typically between three and five years. So, if you are applying vinyl to a floor or wall and plan on replacing it in the foreseeable future, it may make sense to use Standard Calendered Vinyl. Maintaining Standard Vinyl is also easy, usually requiring nothing more than a light cleaning solution and soft cloth, used as regularly as needed to keep the shine of the vinyl bright and vibrant. The good news is, like all Vinyl- Standard Calendered Vinyl will adhere typically to any clean, smooth, glossy surface- especially glass. You can find a wide variety of videos on our website that cover installation on a variety of surfaces. If you have additional questions feel free to contact our customer service center or browse our website for additional hints and tips. 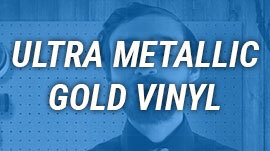 Just what makes Premium Vinyl so great? And is it really better than Standard? Let’s take a step back and find out. 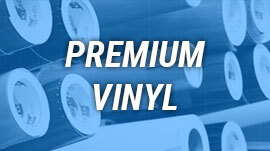 Premium Cast Vinyl refers to the process it’s manufactured from. To put it simply, when Premium vinyl is formed, the vinyl is a liquid solution and is poured into a cast shape. The liquid hardens and becomes Premium Cast Vinyl we can use in our machines. This is different from Standard Vinyl, but the distinction is very important. Because Cast Vinyl is poured into a shape, the Vinyl has a tendency to remain that shape, making it difficult to stretch or warp throughout its lifespan. Depending on your application, this rigidness to the Vinyl can be incredibly useful, especially in exterior applications where the sunlight can blast your vinyl with UV rays and fade lesser quality materials. Premium Cast Vinyl is ideally suited for long term applications and has the rugged quality to last four to seven years on average. Maintaining Premium Vinyl is also easy, usually requiring nothing more than a light cleaning solution and soft cloth, used as regularly as needed to keep the shine of the vinyl bright and vibrant. The good news is, like all Vinyl- Premium Cast Vinyl will adhere typically to any clean, smooth, glossy surface- especially glass. You can find a wide variety of videos on our website that cover installation on a variety of surfaces. If you have additional questions feel free to contact our customer service center or browse our website for additional hints and tips. Can Reflective Vinyl save your company money? Absolutely, Reflective Vinyl is a premium vinyl with a highly reflective side, that has found great use as safety signs and advertisements. Reflective Vinyl is manufactured into a Engineering Grade Vinyl. To put simply, the Reflective Vinyl is embedded with small reflective materials that act as prisms, which is what creates the reflective pattern you’ll see when illuminating the vinyl. 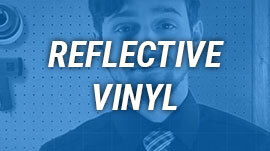 Because the Vinyl is embedded with reflective material the vinyl itself becomes very sturdy and doesn’t stretch nearly as easily as Standard or even Premium Vinyl. This makes it especially useful in exterior placement. Maintaining Reflective Vinyl is also easy, usually requiring nothing more than a light cleaning solution and soft cloth, used as regularly as needed to keep the shine of the vinyl bright and vibrant. The good news is, like all Vinyl- Reflective Vinyl will adhere typically to any clean, smooth, glossy surface- especially glass. You can find a wide variety of videos on our website that cover installation on a variety of surfaces. If you have additional questions feel free to contact our customer service center or browse our website for additional hints and tips. Ultra Metallic Gold is the best solution for high quality presentations and is considered the pinnacle of glossy vinyl materials. Ultra Metallic Gold is unlike other materials, in that it’s made from a much sturdier material that resists stretching or fading and it’s for this reason it’s given the ‘Ultra’ title in Ultra Metallic Gold. The most common uses for Ultra Metallic Gold are in cut to shape lettering, with some of the best results coming from a combination of black on gold lettering… Though Ultra Metallic Gold has been used in a wide selection of projects, from home improvement to business promotions. Visit our blog or call our customer service center for new and exciting ideas for your Ultra Metallic Gold. There’s no denying that Carbon Fiber is incredibly sharp on a clean vehicle under bright lights. Which should make it no surprise that it’s one of the best selling speciality vinyls we offer at Lettering on the Cheap. Carbon Fiber Vinyl is a premium vinyl material, which offers you the best quality for rugged exterior use and harsh UV rays from the sun. The rugged beating premium vinyl can take over a thinner, weaker, standard vinyl is of particular favor for vehicle enthusiasts, as it offers the protection you’d expect from a material that will endure dust, grime, wind and the unexpected atmospheric elements. You can expect Carbon Fiber to be as easy to maintain as any other vinyl we offer at Lettering at the Cheap. With a clean cloth and light cleaning solution, most dirt or grime will be removed. In some cases (depending on your unique situation) you may need something a bit more aggressive of a cleaner to remove grease or other hard to remove gunk. We would suggest you take care when using heavier cleaners, sampling the solution on a small, perhaps hidden section of the vinyl before proceeding to the remainder of the area. While most solutions should be fine on Carbon Fiber vinyl, taking extra care would be the best solution for your investment. Carbon Fiber is inherently shiny or glossy. Those looking for a reflective like material should certainly turn to our selection of Reflective Materials ranging in a number of different colors. 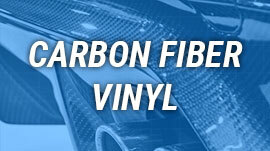 Carbon Fiber vinyl is at its roots a cosmetic material and should be treated as such. No. But we appreciate your effort and we firmly believe you shouldn’t limit your dreams. Carbon Fiber Vinyl provides excellent cosmetic quality at a fraction of the cost of actual Carbon Fiber and has been a fantastic resource for trendy enthusiasts for years. 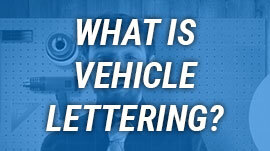 Vehicle lettering is different from vehicle graphics in that it only contains words, letters, or numbers. Most often you can find vehicle lettering used for a decorative quotes, names, or even business fleet numbers. Almost always we suggest premium vinyl adhesive due to the dirt, wind, and general grime that will pummel your vinyl over its lifespan. When deciding on the color or colors of your vinyl lettering, make sure to keep in mind the surface color of your vehicle. You can even temporarily change the surface color when designing on our lettering tool by clicking, "Surface Color". As a rule of thumb for the best visibility use colors that stand out well against your surface color. Today we're here at Lettering On The Cheap and we're going to be doing a full vinyl detail on this car. It's going to be every entrepreneurs dream! Let's check it out, and see what they can do. There's a lot of different choices. Even if you want to have a pretty executive looking car verses if you want to have a car that is really like a driving billboard. Something that adds attraction to the car but at the same time really does a good job of advertising. The size of decals, where you place them, the type of information you're putting on the different areas of the car. A typical sign shop is going to charge you a minimum of $800 to do a job like this. I've seen them go as high as $1,500. This particular job with us is going to run you $200. So you're immediately saving $600 to $900 dollars by simply doing it yourself. You have nothing to worry about. If you have a problem call us. If you damage the lettering we'll send you our a free replacement of that portion of the lettering so you can get it looking perfect. You can really save by doing it yourself by putting your own lettering, graphics, and decals on your vehicles. Establishing and Advertising your business is a critical step to any successful business. 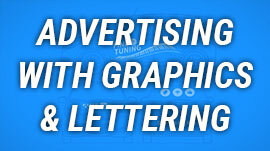 At Lettering on the Cheap we provide you with the tools to save hundreds in expenses to promote your business. 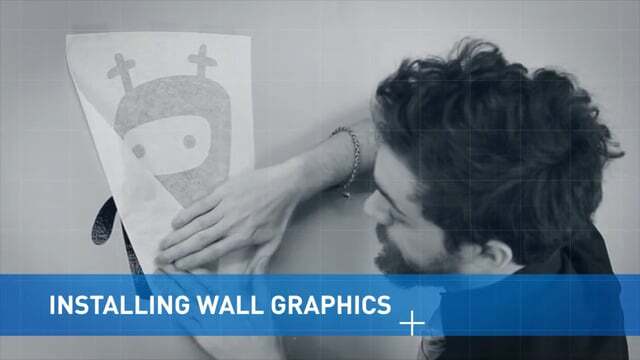 Today we're actually going to be working on the application of a wall graphic and the methods for applying it and adjusting it and making sure it goes on right. The first thing we're going to look at is the wax pencil. If you're measuring out what you want on the wall, you can always use a wax pencil to mark your positions using a ruler or tap measurer. What's great about the wax pencil is it will come off using a light solution. It could be some kind of cleaning solution or it could just be water. So when you're measuring off of a graphic make sure you're aligning it to the top and bottom or the sides of the actual graphic and not the paper. By doing this you're going to make sure that it's actually in the right position and aligned. You should go ahead and take out a level tool to make sure your design will be in the correct horizontal position with your wall or whatever it is you're trying to align it to. Whether it be a wall frame or a picture from or anything like that. The first thing we want to do is actually tape it to the wall. It's going to make the application a lot easier that way. Now it doesn't need to be any special tape or anything like that. For instance, today, we're using just regular Scotch tape and that's going to work fine. For a wall application on a wall like this. This is a very matte wall, it's not very glossy, shiny or anything like that. Because of that it's probably going to absorb a fair amount of water so we're not going to use any kind of solution when we apply it. So this will be a dry application. But for something of this size it shouldn't be too difficult. If you're going much larger you may actually look into getting another person to help you out. Or a glossy surface is typically best because you can wash those down with a wash cloth, soapy water, or application fluid without any kind of problem. Alright so let's go ahead and install the little alien guy here. We're going to flip it up-side-down. Then we're going to peel from one of the corners. We're going to take of the backing just little by little. Now, it's important that you want to take the backing of the vinyl versus the other way around. This is to make it easier and helps make sure the vinyl stays on this kind of semi-sticky backing. Now we want to be careful and make sure it doesn't stick to itself. That's probably one of the bigger mistakes that can be made. Now what we have...Because we had it taped up here, we know it's perfectly aligned. So now we can apply it very slowly from top to bottom. We're going to take our hard squeegie and take it from the very center of the top of the graphic and go straight down. First, we're going to go nice and slow with a little bit of pressure on there. Then, going from the center, we're going to push our way out. Now we'll do the same thing on the other side. Now we're really going to start applying some pressure here. On some applications you may want to use a soft squeegie on more delicate surfaces. But since this isn't a big deal using it up against a wall. if you do have concerns you can definitely use the soft squeegie at first. Now that the decal is down we don't have to worry about it drying or adhering because it is a dry application. We aren't using any type of application fluid or liquids. Because of that it's going to stick rather quickly to the wall. It is worth noting on a glossy surface, vinyl will adhere faster and easier. Especially on something that is very smooth such as glass. But in this case we should be alright. I don't believe we should have any problems removing the masking tape. Again, we can't start at any corner we want. But it is important to start at a corner. We're going to do it just like before and slowly remove the tape. Be careful around smaller pieces like the eyes here. They are the most vulnerable to come up as you're removing the tape. If it does come up you can just push it right back down and continue removing the masking tape. When it comes to removing vinyl patience is a key factor. As long as you're very mindful of what you're doing you shouldn't have any problem. And ta-da just like that, we're done. If there are bubbles you could go out of your way to pop them with a razor blade. Or you could just work them out with a soft squeegie. That's really what the soft squeegie is good for. Once the masking tape has been removed you can come in here and delicately remove the bits and pieces that may be left in there. In this case, however, and probably yours as well, it's going to be a very easy install on a wall. You should have nothing to worry about! Applying vinyl to a flat (non glossy) rough (textured) surface is probably the worst kind of surface to apply Vinyl to. Luckily, we do supply special forms of vinyl for just these scenarios. In this case we’ll be applying a decal onto a wall. We won’t be able to use Application Fluid in this install, as the Vinyl would not stick at all in this case. Applying your Vinyl this way will be more difficult, so we suggest applying with a friend or family member. First measure your surface and determine where the center of your application will go. 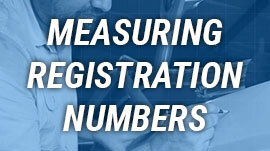 Then, measure to determine where the top or bottom of your decal will be placed. Using a pencil is best in this case, as you can mark the wall without damaging the surface permanently. Once you’ve measured and and marked your surface, you should additionally mark the center points of your vinyl. This way the wall and the decal will align. Now we can apply the decal. 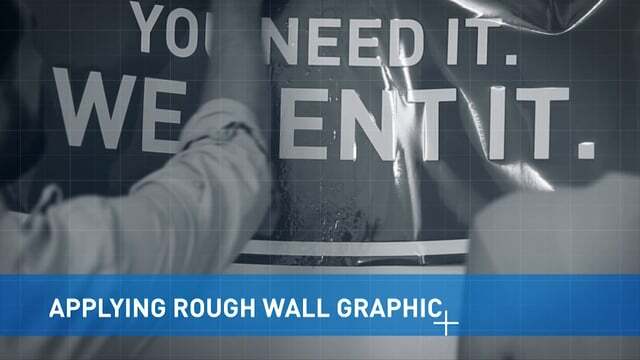 Carefully align to your surface and when ready press the center of your decal against the surface and begin slowly smoothing the remainder against the wall, from the center- out. Having someone else to hold the decal as you work helps a considerable amount. You should be very careful to make sure the decal does not fold in on itself. This is very important as you won’t be using Application Fluid on this flat, rough surface. Using a soft squeegee gently smooth the decal out and remove any bubbles you find upon application. In some cases, due to the texture it may be difficult to remove all of the bubbles. We suggest pin pricking the bubble to release the air trapped inside. Today we're going to be installing some window decals on this window. This is a little different because we're going to be covering the entire window. First thing we need to do is prep the window by making sure that it's clean. This is an outside application so there could be dust, pollen, or a number of things that could make the decal not stick well. Obviously you don't want anything sticking off the glass. You can start by just using any glass cleaner that you would typically use. Next we'll wipe down the surface with rubbing alcohol to make sure the surface is ready for our vinyl. I'm just putting some alcohol on my rag here and making sure I take good care of the corners and edges of this window because that's generally where dirt tends to build up. It's also where decals like to lift up. So really make sure you pay attention to those areas. This could be done with one person but we strongly recommend larger decals such as this to be done with two people. The next step, after you've cleaned the window, is to douse the window really good with application fluid. Then remove the backing from your decal and put application fluid on the sticky side of your decal. You do need to understand that with glass it will be very forgiving but it will take time before you'll be able to pull the tape off the vinyl. With two people, we can remove all the backing from the vinyl. If it was just myself, I would not be doing this. Now I'm going to spray the back of the decal. 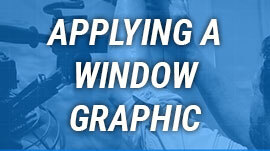 We've got our application fluid on, now we just want to align this decal up with the window as good as possible. 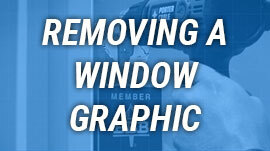 Try to cover all the window and use your soft squeegie to work the application fluid out from behind the decal. The decal will not stick to the glass while the fluid is behind the decal but once it's gone it sticks very well. Be very gentle with your squeegie as you work the bubbles out. Now we can work the decal down onto the glass. We've applied the decal, now what we're going to do is just work the edges and corners. The last step is to wait and push the edges back down and it should smooth right out. This window has a couple decals on it so we're going to take them off. It's not that difficult. This one is old and breaking off so it would be very hard to remove. I'm going to heat it up and be careful not to overheat it. Once you get that decal nice and hot it will get soft and just pull it away using a plastic chiseler. heat makes all the difference in the world. Get it warmed up a little so it gets pliable. This one, however, left some adhesive. So what we're going to do is take some adhesive remover and spray the tacky area real good and let it set for just a minute. You can see the more you work it the more it will turn into a gel. That gel, I find, actually helps. So now what we're going to do is rub the area with rubbing alcohol and that should leave us with a smooth surface. I do this a couple times just in case we missed a spot. These days, if you walk past almost any commercial business with a storefront there are good odds you’ll see static cling attached to the windows. Static cling as it turns out, is a remarkable marketing tool for business’ who are looking to keep their messages fresh and relevant to the time of the year, or their business goals. Static cling achieves this through its easy sticking properties that allow the vinyl to be moved or replaced without any strenuous care required. But there’s a lot more behind static cling than you might imagine as I’ll go on to explain. You may be a bit put off by the thought, but Static Cling doesn’t actually employ static electricity to stick to surfaces and we can do some simple experiments to express how. Static electricity is generated when two surfaces touch one another and the electrons move from one object to the other. I’m sure most of us can remember from our childhood, rubbing balloons against our hair very quickly to produce static electricity. This frenzied motion causes the electrons to take on a positive and negative charge between the surfaces, which causes them to attract. We can quickly see the fault in this logic when applied to Static Cling Decals when we realize that the decals will attract to themselves. If static electricity were involved in this we expect this wouldn’t be the case, as the electrons would be positive on positive Not only this, but the decal itself would only attract itself to a surface as long as a static electricity charge could be held. Anyone who’s managed to place a balloon on themselves with the help of static knows the effect wears off relatively quickly as the electrons return to their resting state. The real culprits that keep Static Cling working are air pressure and molecular bonding which work together to form a connection between the Static Cling and your smooth surface. This is important as I stated previously, as the Static Cling and the surface you’re applying the vinyl to must be a polished smooth surface for best results. One of the most obvious factors at work is air pressure. When you apply a vinyl decal against a surface, you’re effectively removing the air between the vinyl and the surface; this creates an approximate vacuum in the same way a suction cup does. Which explains when you pull a vinyl decal from a surface, there is a slight resistance. This is most notable in rigid materials such as glass against glass. But comparing Static Cling to a sheet of microscopic suction cups is probably the best analogy for understanding the principles of Static Cling. But these principles of molecular bonding and air pressure aren’t far off from another familiar creature. While not directly the same, you could draw comparisons to a Gecko and its ability to hold itself against extremely smooth surfaces by as little as a finger. While the Gecko employs some seriously amazing physics in the palms of its own hands, the Static Cling Material also retains the ability to cling to smooth surfaces using the natural attraction of molecules, this is partially why Static Cling Decals are made from an incredibly smooth material. While you can certainly use Static Cling Decals for exterior use, it’s important to remember that because the material has no adhesive it’s susceptible to being blown off by heavy gusts of wind. This is especially true if the surface wasn’t cleaned properly. Because Static Cling is so often used on glass, we would encourage applying the vinyl to the inside of glass windows- to avoid the harsher exterior elements from affecting your decal. Time itself can hinder your vinyl too. While taking off and moving your decal should be no issue (in fact we encourage it from time to time), leaving static cling removed from a surface for extended periods will slowly but surely remove the “sticky” properties of the vinyl over an extended period of time. Hello fellow Do It Yourselfers, I've got great news. Lettering On The Cheap has your back with affordable, simple solutions for applying your own vinyl. May I present to you, the Goof Proof Guarantee. First, watch some of our quick how-to videos and learn how easy it is to get started laying down your own vinyl. But we don't stop there! We're so confident that if for any reason you goof up your installation, we promise to produce your vinyl for free. 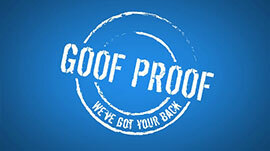 The Goof Proof guarantee! It's that simple. Why pay more, when you can pay less? Windy conditions or unfavorable weather is most often the cause of ruined vinyl. Choosing a proper surface should also be a large consideration when choosing a place for your vinyl. Ideally, the surface will be smooth and glossy and wiped down of dirt and grime. When measuring your lettering in the design tool, remember that the lettering is measured from the top of the letter to the bottom of the lowest hanging letter, like a y or j. If you’re applying a graphic or lettering to the back of your window, remember the vinyl is intended to adhere to the front of the window. So would have to be flipped prior to production to ensure it adheres during installation. 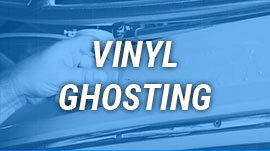 Vinyl Ghosting is caused by old vinyl covering a surface over an extended period of time and then being removed. The vinyl actually protects the surface while adhered, while the uncovered surface is blasted by UV rays and possibly other dirt and grime. As a result, removing the old vinyl often results in ‘ghosting’ a slightly brighter, cleaner and polished surface. Unfortunately, there’s no honest way to prevent ghosting other than to store your surface out of direct sunlight, which may not always be possible. Due to this, the best option is to replace the old vinyl with new vinyl that will cover the ghosting. © 2019 LetteringOnTheCheap.com. All Rights Reserved.